Chairman of the Board of Directors of Intesa Sanpaolo since April 2016, after being Chairman of the Management Board of Intesa Sanpaolo from May 2013, he is currently the (non-executive and independent) Chairman of ASTM S.p.A. and the Lead Independent Director of Edison S.p.A.. He is Deputy Vice Chairman of ABI, a member of its Executive Committee and a member of the Corporate Governance Committee of Borsa Italiana. At LUISS University, where he currently sits as a member of the Board of Directors, he served as Head of the Department of Economics and Business from 2004 to 2011. Full professor of Business Economics first at Turin University and then at LUISS University, from 1974 to 1995 he was the Manager of the Institute for Economic Research on Firms and Growth, the main body of CNR, the Italian National Research Council, in the economic field. 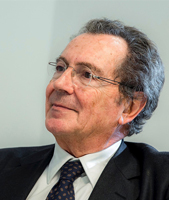 He was an Independent Director at Fiat for nine years (2005-2014), also chairing the Audit Committee, and was the Chairman of Atlantia from 2002 to 2010. Worth mentioning among his previous assignments is the role of Chairman of ENI (1999-2002) and IRI (1997-1999).